During an interview with Fox News' Tucker Carlson, which will air at 8 p.m. EST Tuesday, President Trump called former CIA director John Brennan "a very bad person," according to a transcript obtained by the Daily Caller's Saagar Enjeti, hitting back at Brennan for criticizing his performance in Helsinki as "nothing short of treasonous." Why it matters: There have been no indications that Trump intends to soften his criticisms of the U.S. intelligence community, even as people from across the political spectrum continue to express their shock and outrage following Trump's failure to stand up to Russian President Vladimir Putin. 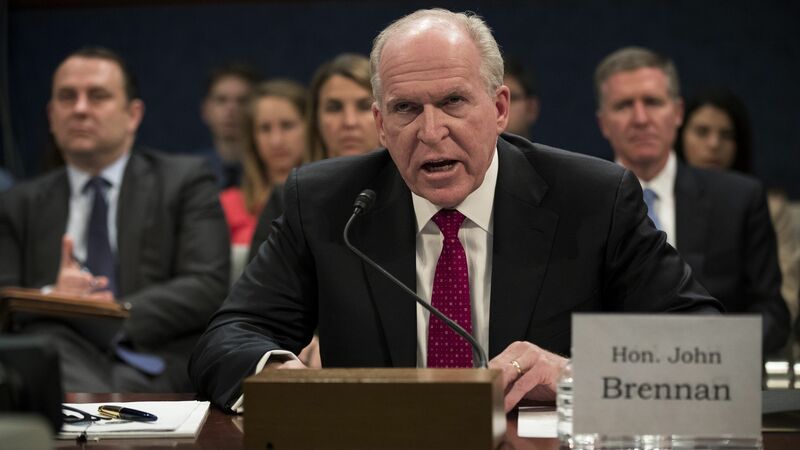 "I think Brennan is a very bad guy and if you look at it, a lot of things happened under his watch. I think he's a very bad person. I also think when you watch Peter Strzok and Lisa Page, when you watch all the things that have happened — Comey, you take a look at that and McCabe who has got some pretty big problems I assume, you look at the deception, the lies — these are people that in my opinion are truly bad people, and they're being exposed for what they are."